The Horsefield tortoise (Agrionemys horsfieldii), also known as the Russian tortoise, is a small species from Eurasia that can be found in the Mediterranean region. An adult female tortoise can grow to be eight inches in length and is slightly bigger than a full-grown adult male. The Horsefield is a hibernating tortoise with a natural lifespan of between 40 and 80 years. When buying a Horsefield, always check that the tortoise has been captive bred and is not one that has been taken from the wild. It should be alert and be playful, so don’t buy one that is obviously not interested in interacting with humans or with others of its own species. 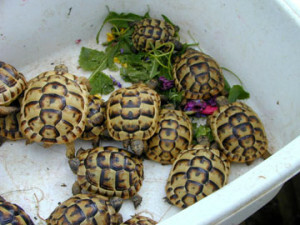 Care should be taken to make sure that tortoises do not overeat, but they do require to be given fresh food every day. It’s also important to make sure that Horsefield tortoises always have access to fresh drinking water, particularly the females when they are breeding. Horsefield tortoises require a balanced vegetarian diet. The diet can include a wide variety of plants, as long as they are not poisonous and have not grown in an area sprayed with agricultural chemicals. No fruit should ever be fed to a Horsefield tortoise. It’s also better to avoid salad vegetables such as cucumbers, tomatoes, iceberg lettuce and spinach. All poisonous plants must, of course, be kept away from tortoises. Leafy greens and weeds should be a big part of the diet, including dandelion, mallow and common grasses. Violets, pansies, petunia, hibiscus and wild rose petals can be added for some seasonal variety. In order to maintain a healthy shell, a tortoise needs plenty of calcium in its diet. Calcium supplements can be purchased from any good pet store. Limestone flour, which is very high in calcium, is available from most equestrian suppliers. Calcium, mineral and vitamin supplements should be scattered over the leaves that form the main part of the diet. A Horsefield should never be housed with any other tortoise species, but it will be happy being housed with other Horsefields. This species cannot tolerate high humidity and must never be kept in damp conditions. Suitable housing, indoors or outdoors, needs to be prepared in advance of a tortoise being purchased. Make sure that an outdoor enclosure is well drained and can be kept dry. The Horsefield is very adept at digging and tunnelling, so a layer of wire mesh should be placed at least eight inches below the surface. Different ground levels formed of mounds and rocks will make a tortoise feel safer and less exposed. Climbing rock surfaces also helps to keep claws short. Additional shelter has to be provided within an outdoor space. This should be a shelter where a tortoise can stay warm, dry and well out of reach of any predators. A screen around the shelter can be formed of small rocks or large stones. This will provide a protective barrier which a tortoise may also like to climb. Both outdoor and indoor housing must be kept clean and dry. A ground layer of sand, soil and gravel can be topped with hay and woodchips to provide a suitably dry surface. A dish of clean water should always be provided. A few clean stones placed in and around the dish will allow easier access for younger, smaller tortoises. A feeding platform can be made from a piece of slate or a flat rock. This will prevent food from getting mixed in with dirt and other non-edible substances. Always check that a tortoise is in good health before it goes into hibernation. In the weeks leading up to hibernation a tortoise’s food supply should be gradually reduced, so no food remains in its system during hibernation. Bathe a tortoise in warm water, and make sure it’s clean and dry, immediately before placing it in a hibernation box. Outdoor hibernation should take place for at least two to four months, at a time between October and March when the temperature is at its lowest. A tortoise can safely be left to hibernate in its usual outdoor shelter. Indoor hibernation need to be temperature controlled and the tortoise should be placed in a hibernation box for two to four months. Pairs of tortoises that have been raised together are more likely to be successful in breeding when they are 7 to 10 years old. Only healthy adults should be encouraged to breed. The temperature has to be kept right for mating to take place immediately after hibernation. Horsefields are most likely to mate during the months of March to May. The female will lay her eggs inside the housing, where she will dig down in the ground before laying them. She should therefore be provided with at least a six inch layer of sand and topsoil, covered with dried grass clippings, leaves or hay. She may lay a batch of eggs every two weeks, and she will consume more drinking water at this time. When the housing is kept dry, warm and safe from predators, an incubator should not be necessary. Baby tortoises are active from the moment they hatch, but great care needs to be taken when handling their little bodies and shells, which are softer and much more sensitive at this stage. 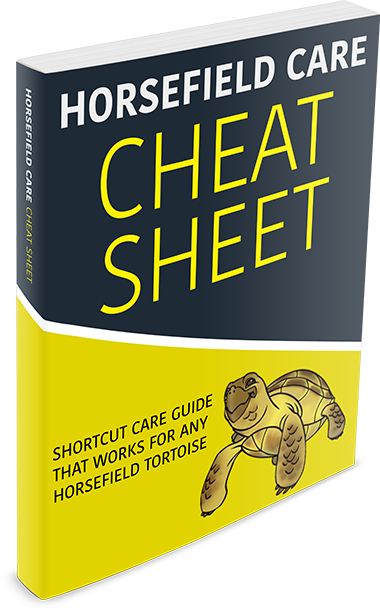 When a Horsefield tortoise has a good diet and is kept in the right conditions, it should remain in good health, but like all pets they can be affected by minor ailments and injuries. When a tortoise is not eating, becomes inactive and generally appears to be sick or incapacitated, it’s essential to get it looked at by a veterinarian. Isolate a sick tortoise from healthy ones and transport it in a box, lined with hay and with plenty of airholes. Horsefields are long-living pets. Well housed and kept in good health, they can remain much loved companions for as long as 75 to 80 years.